Home Other Articles Catapult: What Is a Catapult? 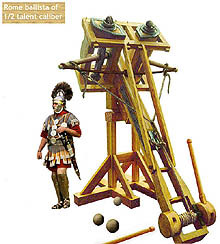 A catapult is a device used to throw or hurl a projectile a great distance without the aid of explosive devices — particularly various types of ancient and medieval siege engines. The earliest writings of catapults were that they originated in China around the 3rd and 4th Century BC; this type of catapult was much like a big crossbow. They stood around 8 feet tall. The Catapult: the winched-down bucket that people normally think about when they hear the word "catapult". The Ballista: A very large crossbow. A Trebuchet: A weighted beam that swings a sling carrying the projectile.